Back in the early days of Destiny, some players would spend hours just...shooting into a cave. The reason? Loot. Precious, precious loot. Shooting at a black hole for hours on end isn't our dream for how Destiny is played. Our hope is that social engagement in public spaces is only one part of the Destiny experience. Expect changes soon which decrease the efficiency of cave farming and correspondingly increase engram drops from completing activities. 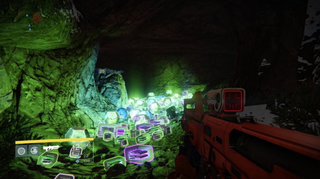 Today, during a GDC panel on how Bungie researched and tested the player experience in Destiny, Bungie's John Hopson cited a completely different reason for why Bungie killed the Loot Cave. But sometimes, players would get distracted from these activities and they'd start doing other things. Strange things. Like, say, shooting endlessly into a cave—all in the name of loot. And when Bungie looked into it, what they found was that the Loot Cave wasn't nearly as good as players thought it was. "They were very weak enemies that didn't drop very good loot," Hopson said. "The funny thing is that we knew about [the loot cave] before launch, we knew that this was potentially exploitable activity, but we didn't care. The actual drop rate per minute spent is not any different than anything else. "So you actually will get less loot [shooting into the loot cave] per hour than you would just playing the game. But the players weren't doing the math that way," Hopson said. Hopson theorized that players shot into the loot cave mostly because it was low effort, not because it was actually better than other locations. Somehow, some players convinced themselves that the Loot Cave was amazing, but that wasn't actually the case—or so Bungie says. So if Bungie didn't initially care about the Loot Cave, and it wasn't actually broken, why did they end up killing it? Hilariously, it was because of the sheer number of player complaints. "The time of the loot cave was the highest peak of players reporting each other for cheating," Hopson said. Hopson described situations where players would angrily report other players for using the loot cave. Sometimes, these players would take matters into their own hands and actively stop enemies from respawning in the cave—thereby stopping the more loot from appearing. And when players did this, the players who wanted to use the loot cave would report the jerk players. It was a mess—so they got rid of it. "[The Loot Cave] was actually pretty controversial," Hopson said. Hopson also mentioned that Bungie spent some time getting rid of other Loot Caves prior to the launch of Destiny, in the hopes of stopping the phenomenon of players shooting into an area endlessly to reap the rewards. One person got up to ask why they didn't have a Gjallarhorn despite playing for over 700 hours. Hopson said that unfortunately, SOMEone had to end up being that unlucky. Another person got up to ask if Bungie could stop Xur from selling more No Land Beyond—the gun that is infamous for being awful. Hopson said it was out of his control. Hopson mentioned that Bungie didn't expect the random drops to be as big of a deal as they ended up being. What they were expecting was for players to simply buy better gear, and to have random drops act as the cherry on top, so to speak. Instead, players have latched onto the RNG, and it's affecting their perception of the game. Hopson said that during development, in an effort to stop Destiny from leaking, they increased their security at Bungie. This meant metal detectors, locking up tester's cell phones, never leaving people alone with the game, testing on platforms that were locked down. He said it was "probably overkill," but that these measures let them get people outside of Bungie playing the game for research early on. The hardest missions for players end up being ones like the "Chamber of the Night" level—essentially, levels where players are locked in a room where they have to defeat waves, right before having to go up against a boss. These levels don't have save points between waves, and they exist as "skill checks" for players—you can't hang back and snipe or anything like that. "You're either good enough to survive or not," Hopson said. Apparently, some of these levels ended up being so difficult, that they lost a "few percentage of players" during these points—and sometimes, these players wouldn't ever try the levels again.